This entry was posted on January 20, 2010 at 2:45 am	and is filed under BASEBALL, Boston Red Sox, Jacoby Ellsbury, RED SOX, Ted Williams. Tagged: Bill Monbouquette, Boston Red Sox, Jacoby Ellsbury, Ted Williams. You can follow any responses to this entry through the RSS 2.0 feed. You can leave a response, or trackback from your own site. Billy Martin was not a Yankee on July 18, 1958. 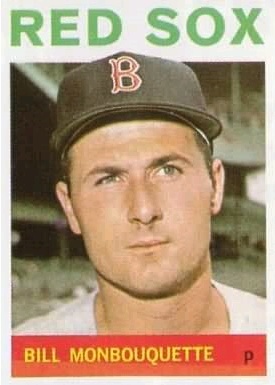 Martin was traded by the Yankees after the May 1957 Copacabana incident. Martin spent the whole 1958 season with the Detroit Tigers. I remember Monbouquette as a pitcher with the Yankees in 1967-68. Monbouquette’s debut came against the Tigers on that date, not the Yankees. As for Martin stealing and all, you have that right. The next time up, Martin actually singled to left off him. See http://www.baseball-reference.com/boxes/BOS/BOS195807180.shtmlMonbouquetwww.basebll for the boxscore and rundown of that game.